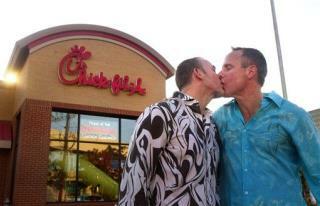 (Newser) – Might Chick-Fil-A be having a change of heart over its high-profile stance against gay marriage? An advocacy group in Chicago thinks so, and chalks it up to business reasons. The Civil Rights Agenda says the chain wrote an email to a local lawmaker promising that its foundation "is now taking a much closer look at the organizations it considers helping, and in that process will remain true to its stated philosophy of not supporting organizations with political agendas," reports BuzzFeed. This is a prime example of why businesses and people as a whole should leave their religion wherever they found it. Fast food is no place for a sermon or a controversy regarding civil rights. It's a restaurant, people. I don't care where you're sending your money. Don't tell us. I just want my number 3 without a side of opinion and a large order of persecution. I don't know about anyone else but that photo makes me want to spit. Just disgusting. Please take that to your bedroom and keep your perversions in private. I really dont see the big deal on this?